Ceremony Yadnya Kasada Bromo is a day of ceremony in the form of offerings to Sang Hyang Widhi offerings. Every month Kasada 14th day in Javanese calendar held the ceremony of offerings to Sang Hyang Widhi and ancestors. Mt. Bromo has been known as one of major international tourism destinations in East Java, Indonesia. Its beautiful landscape and unique geological characteristics have been strong magnet that attracts travelers to come to see its beauty on their own. Surrounded by sea of sand and also savannah in its southern side, along with the smoke that comes out of its crater, Mt. Bromo offers a breathtaking post card perfect view to its visitors. The sunrise over Mt. Bromo is also said to be one of the most beautiful on earth. 1.1 When is the Kasada ceremony in Bromo 2019 ? 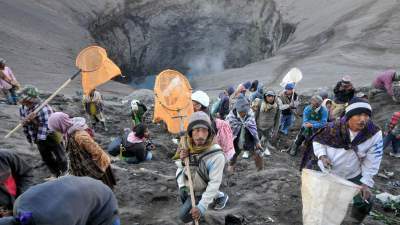 The Yadnya Kasada Traditional Ceremony on Mount Bromo is celebrated every year. The existence of Yadnya Kasada Festival has important events always held as offerings to the gods. They celebrated a Yadnya Kasada ceremony as a form of gratitude for the gift of gods for welfare, abundant harvests, etc. The festival time for the Yadnya Kasada Ceremony in Bromo is always celebrated every year and the ceremoni of the Bromo Kasada 2019 according to the ancient Javanese calendar Yadnya Kasada ritual is always held at the time of the full moon. When is the Kasada ceremony in Bromo 2019 ? Right on the eve of the 14th month Kasada, Tengger tribe would together carry offerings of livestock and agriculture to Pura Luhur Poten and wait until midnight time when the shaman ordained elders. Next, prepared offerings brought to the top of the crater of the mountain to be thrown into the crater as a symbol of the sacrifices made by our ancestors. For Tengger tribe, the offerings were thrown into the crater Bromo as a form of vows or gratitude for livestock and agriculture are abundant. In the crater appeared to have waited many beggars and perch population living in the interior. Interestingly they long ago had come here even deliberately set up temporary residence in the vicinity of Mount Bromo and hope to get ongkek – ongkek containing offerings of fruits, livestock, also money. Activities perched inland residents who are in the crater of Mt Bromo you can see from the evening time until noon time the day before the Yadnya Kasada Ceremony celebrated. The celebration of Kasada on Mount Bromo will be held on July 17-18, 2019. Bromo Kasada Ceremony is much awaited by many tourists, to watch this traditional Tengger tribe program you should spend 1 or 2 nights at Ngadisari (near the sea of Bromo sand) Because the process traditional rituals of Kasada Bromo take place since midnight or early morning. And here we offer a Bromo tour package 2019, special event Kasada ceremony. Here are the package choices. If you are interested to Visit Mount Bromo during Yadnya Kasada Ceremony Bromo,You could contact us by email or whatsapp to get information about bromo tour package price using kasada ceremony bromo in 2019.